discountscrubs' booth, featuring 2268 items, including Baby Foot Original Foot Peel, Lavender Scented, 2.4 fl. Oz.. 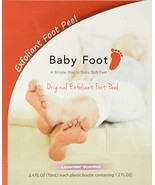 Showing 1 product in "Health & Beauty"
Baby Foot Original Foot Peel, Lavender Scented, 2.4 fl. Oz.